As most of you who follow my posts regularly know, I participate in my community's local farm market every Saturday July to October. I started this about three years ago when I was looking for outlets in which to sell my first book, Fern Valley. But as time went on, it became so much more then that. It became a place to socialize with fellow vendors. It became a place to meet members of the community I would not normally have met as a stay-home-mother. It became a place to take the baked goods I love to produce. A reason to try new recipes. A place where Emily could play with other children in the community. A place to buy local products such as crafts, honey, jelly, fruits, flowers, and vegetables. In short, a truly pleasant part of my life. I find it interesting to see what harvest people will bring to the market each week as the season progresses, and so I thought this week I would share a garden related book my daughter won during the summer reading program at our local library. It is called Victor's Garden and the really interesting thing about this book is that if you flip it over, the story is told in Spanish as well as English. It is a story about a shy boy named Victor who gets permission to start a garden in a lot next to the school with help from his science teacher. At first only a handful of kids join them, but interest soon grows right along with the veggies. 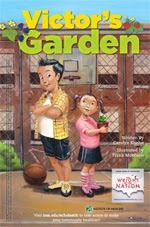 The theme of the book is good nutrition, exercise, and good health. The only negative item I found in the story was when the science teacher took Victor's soda and poured it on the vegetables. 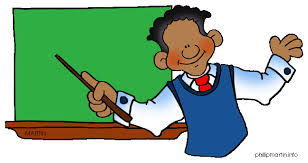 When Victor told him soda wasn't good for the plants, the teacher replied that it wasn't good for him either. And while I agree that an overabundance of soda is definitely not healthy, I really don't think an occasional soda is going to be detrimental to one's health. It's all about moderation. All in all though, it was a very good story. Another exciting thing happened this past week as well. I had a book all lined up to read, but Emily beat me to it. And then to top it off, she enjoyed the story so much she asked if she could read it to me. It really doesn't get much better then that my friends. 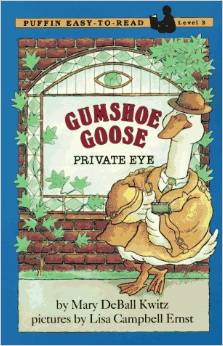 The book she enjoyed so much was called Gumshoe Goose: Private Eye. Now I don't know about you, but I just love the word Gumshoe. It is such a deliciously old fashioned word and one that most kids probably wouldn't even know today. So if you want to treat your young readers to a new vocabulary word and a story of a goose that is a detective, then I suggest you look for this book. If you do, you will follow along as goose expertly figures out who kidnapped Baby Chick Chick and is holding her for the ransom price of one chocolate cake! Well, that about wraps it up for this week. Join me next week for another exciting episode, same crazy time, same crazy channel. And feel free to drop by my personal website, Fun With Aileen, any day of the week for even more on reading, writing, my very own early grade chapter book, Fern Valley, and my soon to be released sequel, Return To Fern Valley, coming September second! I'm also on twitter @AileenWStewart if you want an extremely brief glimpse into my days. Homeschooling, Classics, and Ohio Indians! Summer is just about over and kids everywhere are heading back to school. This year, we are doing something a little different__ we are homeschooling through the Independent Studies program of Emily's former Christian school. It's scary and exciting all at the same time since we have yet to establish a routine, but I think we are going to have a blast. I have been collecting books from library sales, thrift stores, and garage sales to use in our reading lessons. 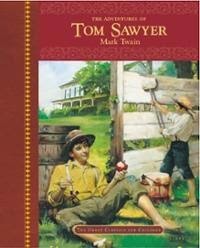 I was most excited this past week when I found a copy of The Adventures of Tom Sawyer for only fifty cents. It is my hope, that by the time Emily is an adult, many of the classics I read and loved as a child will have entertained her as well, classics like Tom Sawyer, Black Beauty and Heidi. We also got a bit of a head start on our schooling by taking day trips this summer. Our first was to the Velvet Ice-cream factory in Utica, Ohio. And just this past week, we drove down to Dayton to attend the Flute and Arts Fair at the Sunwatch Indian Village and Archaeological Park. I can't believe what a great time Bobby, Emily, and I had. We learned quite a bit about the former Indians of that area called the Fort Ancient Indians. We learned about their diet, their way of living, their sun calendar, their lodges, and so much more. In the museum portion, we heard an audio clip about how their diet affected their height and how they had very poor dental health. 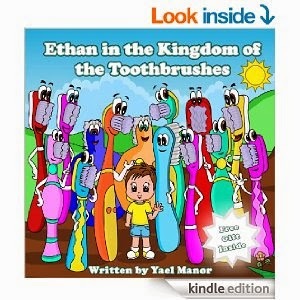 I thought this was an interesting fact since the Kindle book I downloaded for this review was called Ethan In The Kingdom of Toothbrushes. I downloaded my copy during a free promotion, but normally it is $2.99. The idea of a small boy who doesn't want to brush his teeth and dreams of a forest of toothbrushes is a unique and clever idea. And if you can overlook the errors in capitalization, verb tense, and formatting, it isn't a bad book, especially if you have a small non-brusher of your own. As we get ready to start our new schooling journey, I eagerly anticipate many more great field trips. Next month we are going to attend a Renaissance Fair and I even found a children's book on the Renaissance to read which I will share when the time comes. Meantime, I wish all of you and your children a wonderful new school year and continued happy reading! Sometimes we get so caught up in the hustle and bustle of our every day lives that we forget to slow down and take it easy. Children tend to especially be this way. Emily is always busy with a project of some kind, or a friend, or an event, etc... So busy, that she is barely done with one thing or another before moving on to the next. This is probably why I have a living room full of half completed Lego empires, craft supplies, and assorted stuffed animals and dolls. And although I'd like to slow down a bit this week, I doubt it will happen because I have Cookbook Club on Tuesday, Baking for Farmer's Market on Wednesday and Thursday, Trip to an Indian Village on Friday, and Farmer's Market and a birthday party on Saturday. But the good news is that the following week I don't have anything scheduled and I plan to relax. 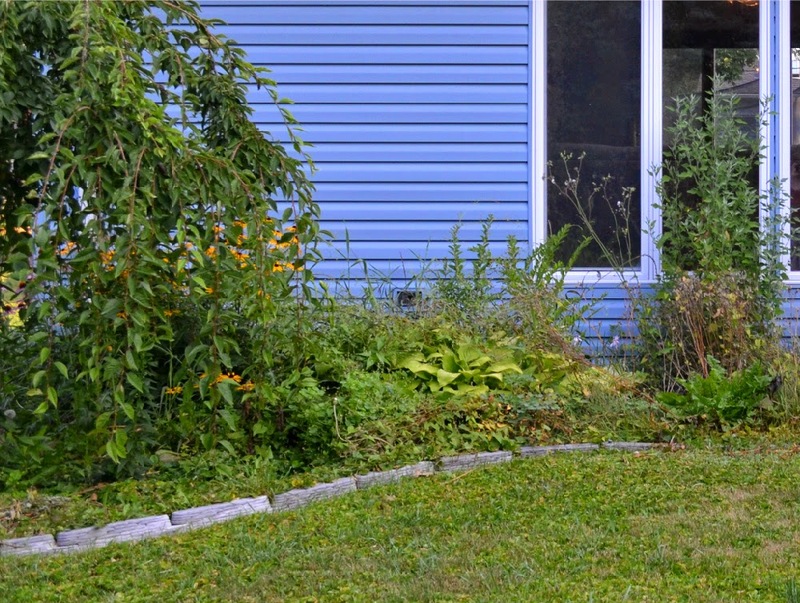 I might even get some weeding done in my very overgrown flower bed. Don't worry, weeding is my therapy and quite relaxing. My I'm too busy overgrown flower bed! With all of the business going on, I thought it was quite ironic that one of the books I had brought home from the library for reviewing was all about slowing down. 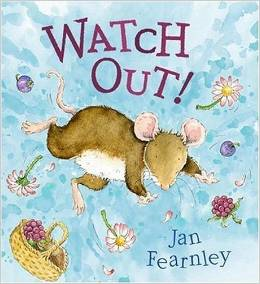 It is a delightful book written and illustrated by Jan Fearnley and is called Watch Out! Although this book was published back in 2004, it is well worth tracking down a copy to read about little Wilf. Wilf is a small brown mouse who hurriedly scurries about and always manages to get into a mess. Wilf is not a bad mouse. He is just so busy being busy that he ends up in some predicaments. I can relate to this and what happens to his mom when she does the same thing. There has been many a time that I have spilled something or tripped because I was in too big of a hurry. So take it from me, slow down once in a while and smell the roses as the old saying goes. Books To Cheer One Up! This past week was a normal week full of both highs and lows. The kind of week most everyone has. The biggest high had to be the KitchenAid mixer and shredder attachment with which my sister surprised me. Of course, I had to immediately try it out by shredding cups and cups of zucchini as well as mixing the quick breads I sell at my local farmer's market. 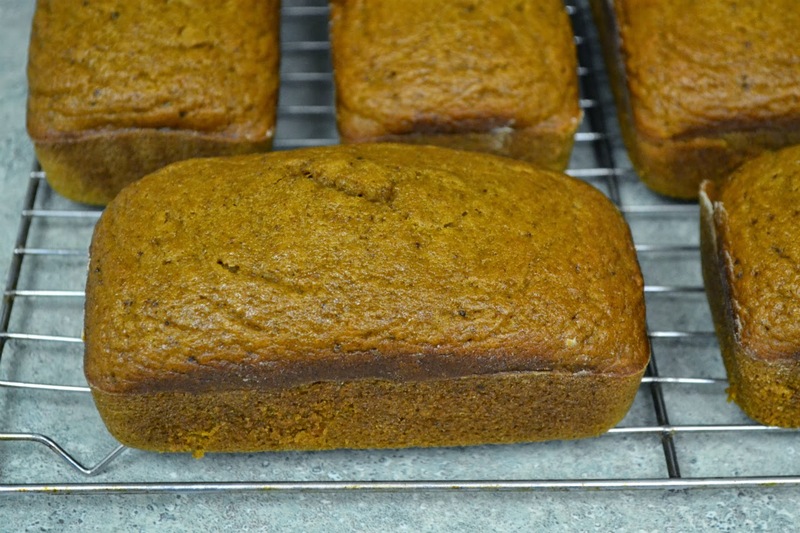 I even tried a new recipe for chocolate zucchini bread which I will post at the end of this article. Another high was the night we went bowling and I scored the highest score of my entire bowling career... a 129. 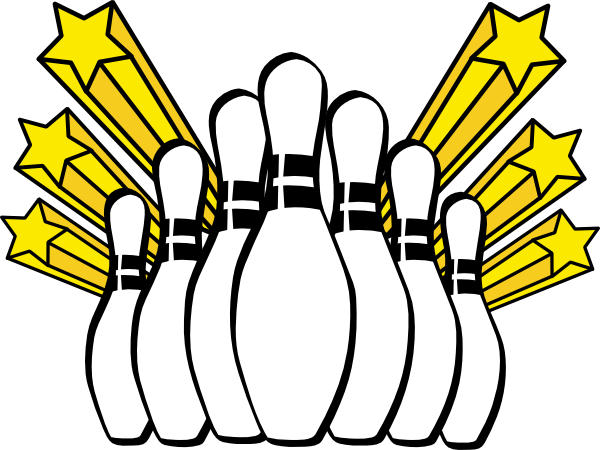 And just in case you might be laughing, I want you to know that what I lack in bowling ability I make up with enthusiasm! The first low which actually wasn't all that bad was the day I mowed my mother's lawn and it started to rain. At least it was light and It cleared up after only about fifteen minutes. The next not so great moment occurred during the farmer's market where it once again started to rain. Not having a tent when you have books for sale, does tend to worry one a bit. But I just popped the books into ziplock bags and waited for the sprinkles to stop. Despite the misty start to the morning, my sales of baked goods were pretty darn good. The final low showed its face at the end of the week when I entered photographs in my local county fair. I entered nine photos and thought I would do pretty well. 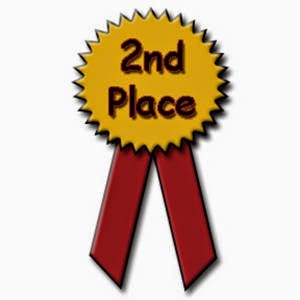 To my surprise, I only received two second place ribbons, one for a rooster and one for some pampas grass in winter. Of course I was disappointed, but I really was happy to have won any ribbons at all. But that wasn't the low, the true low, the one that almost made me cry, the low that brought a frown to my face was the fact that so few people entered anything in the fair. The arts and crafts building was almost bare. There were barely a dozen jars of canned goods. There were only a half dozen decorated cakes. There weren't that many photos. And there weren't even that many fruits and vegetables entered. You don't know how truly sad the only plate of grapes looked despite its first place blue ribbon. How can a person be excited about winning when they are the only one that entered? So saddened by the demise of fair participation, I rode home in silence. And for anyone who knows me well, that is an almost unheard of happening. Thankfully, I had a pile of good books to read. And thankfully, that and writing this review worked wonders and cheered me up immensely. 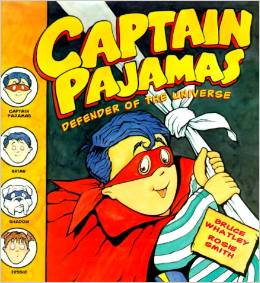 The first book I read was a truly funny read called Captain Pajamas: Defender of the Universe. I'm pretty sure you can only find this book used or at your library, but I recommend you make the effort to find and read it. It is the hilarious tale of a super boy and his super dog working hard to defend his sister form the aliens he believes are in his home. 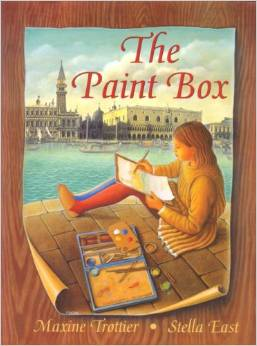 The second book I read was The Paint Box and it was a beautifully told story of a young Venetian girl in the late 1500's who had to dress like a boy in order to accompany her artist father around Venice to galleries and workshops. Although this story is fictional, the main character, Marietta, really existed and was a fine painter. Preheat oven to 350 degrees. Grease and flour five mini loaf pans and set aside. In a large bowl mix sugar, oil, eggs, and vanilla. Gradually add dry ingredients and stir thoroughly. evenly divide batter between the five loaf pans. Bake for 35 to 40 minutes or until a toothpick comes out of the center of a load cleanly. Cool a few minutes and remove from pans to cool the rest of the way.